Fr. 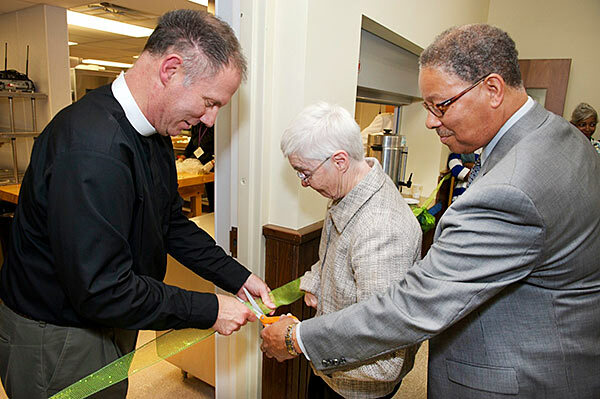 David, left, helps Patricia Saunders and Jeffy Lucas cut the ribbon on our renovated kitchen. Every Sunday, food prepared in this kitchen by several local churches is served to over a hundred people at 7:00 a.m. When starting his ministry at SsAM in 2010, Fr. David wrote: “I am so excited and humbled to have been called to be the next rector of the Episcopal Church of Saints Andrew and Matthew. 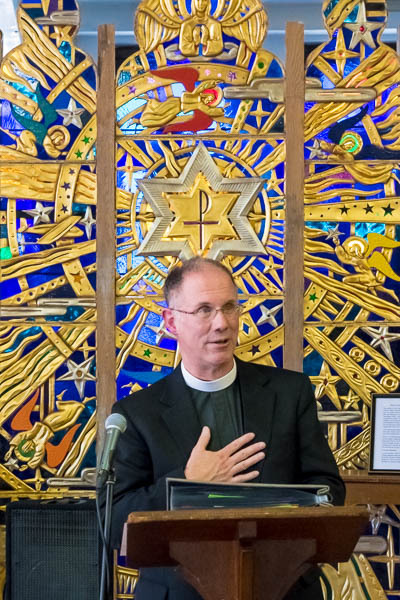 “When I began my discernment with the Search Committee before arriving at SsAM, I was immediately drawn to your commitment to issues of justice and outreach for the Wilmington community and the world. I was impressed that even in the midst of so much uncertainty as a result of the nation’s economic downturn, SsAM is still focused on ways of reaching out to others. “One of my passions is to open the Church to the world in the spirit of radical hospitality. I believe Jesus calls us to welcome all, no matter who they are or where they come from. A festive send-off for the Rev. David Andrews as he begins a 4-month sabbatical in April, 2018. Photo taken at Episcopal Church of Saints Andrew and Matthew, downtown Wilmington, Delaware, March 11, 2018. Congregational Development — How can SsAM be more fully alive? How can we be a better expression of the Body of Christ, the People of God? Click here to see the Congregational Development website that Fr. David recommends. The Rev. David T. Andrews Jr. was welcomed as our new rector at a celebration on May 23, 2010. Click here to see the photos by DeVere Patton and Danny Schweers. Click here to read the sermon given by the Rev. Jennifer Baskerville-Burrows on May 23, 2010, at Fr. David’s welcome.